Skinade is a multi-award winning, natural peach and mangosteen flavored anti-ageing collagen drink containing a patent pending formulation of active ingredients that boosts your body’s natural production of collagen and hyaluronic acid. Skinade improves the way your skin looks and feels in as little as 30 days. One of the key ingredients is Omegas 3 & 6 – these fatty acids are known to help balance out dry and oily skin from within, which in some cases can be a leading cause of acne. 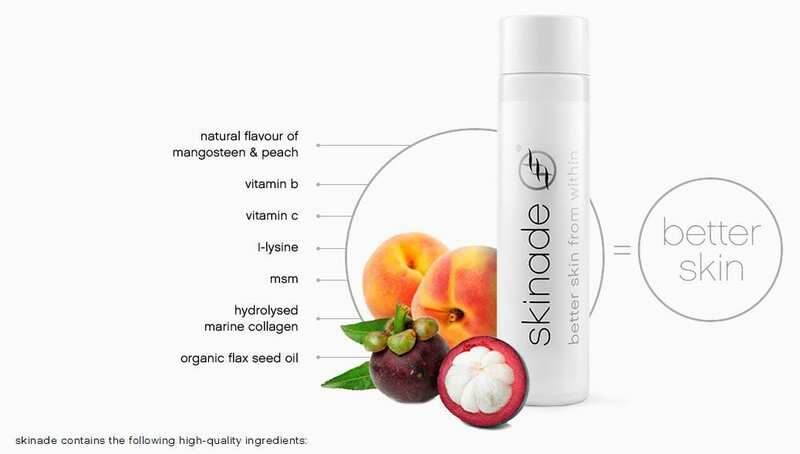 Skinade delivers essential micronutrients in liquid form and helps to re-build the collagen matrix in your skin. Skinade combats the signs of ageing by reducing oxidative stress, preventing cross linking of collagen fibers, increasing moisture and hydration, increasing natural hyaluronic acid production within the dermal layer of the skin. 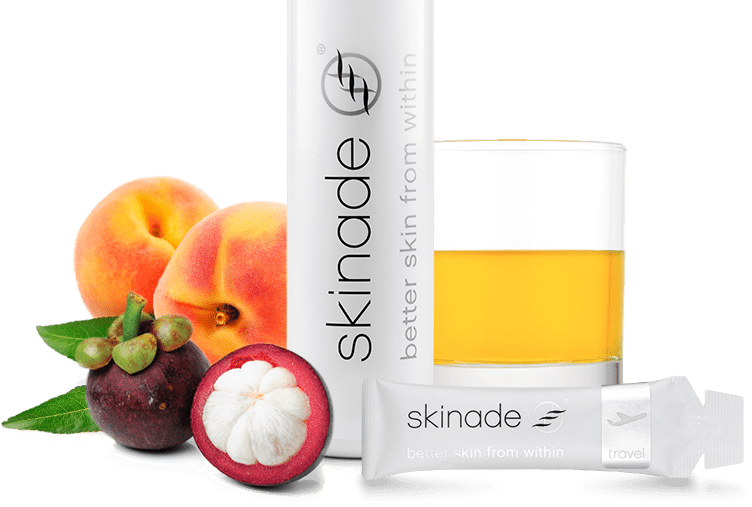 As a result Skinade restores your skin’s youthful appearance, improves tone, texture, hydration, smooths furrow lines and improves skin suppleness. Skinade comes in two versions: a ready-mixed 150 ml bottle and 15 ml travel sachet. Both products have exactly the same efficacy. -Skinade regular comes in a ready-to-drink 150 ml bottle. -Skinade travel is a 15 ml liquid concentrate. 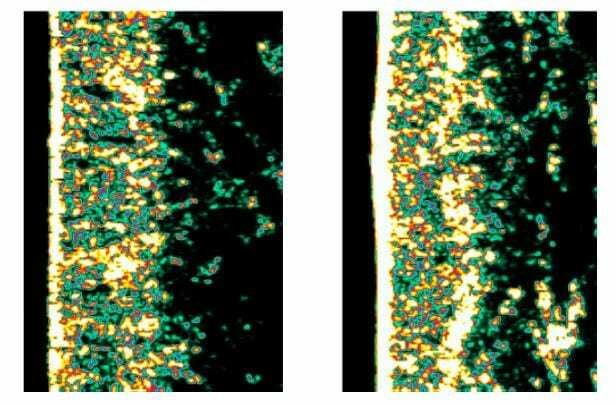 The trial was conducted at the state of the art Santi Skin Labs (www.santiskinlabs.co.uk) in South Kensington led by Tariq Karim and his research team Dr. Akbar de Medici and biochemists Steve Baker and Sonia Karim. 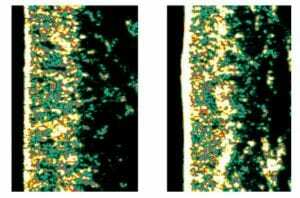 You can see in the image that her skin appears thicker and the collagen structure (the yellow areas) looks denser than before the trial (before is on the left, after is the right). Subject made no other changes to her skin care routine other than completing a 30 day course of Skinade.